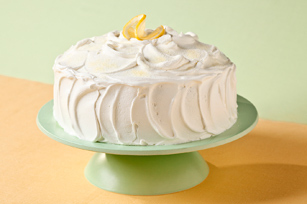 Combine your fondness of lemonade with your love of easy dessert recipes and try this gloriously creamy lemon cake. Serves a dozen (scrumptiously). Prepare cake batter and bake as directed on package for 2 (9-inch) round cakes. Cool 10 min. ; remove to wire racks. Cool completely. Cut each cake layer horizontally into 2 layers; pierce with large fork at 1/2-inch intervals. Reserve 1 tsp. drink mix. Blend milks, sour cream and remaining drink mix in blender. Stack cake layers on plate, pouring 3/4 cup milk mixture over each cake before covering with next layer. Refrigerate 1 hour. Frost cake with COOL WHIP. Sprinkle with reserved drink mix just before serving. Keep refrigerated. Pour milk mixture into clean plastic bottle with squirt tip. Insert tip of bottle into holes in cake before squeezing milk mixture into holes. Prepare cake batter and bake in 13x9-inch pan as directed on package. Cool completely. Do not remove cake from pan. Pierce cake as directed; pour milk mixture over cake. Refrigerate 1 hour. Frost with COOL WHIP, then sprinkle with reserved drink mix.